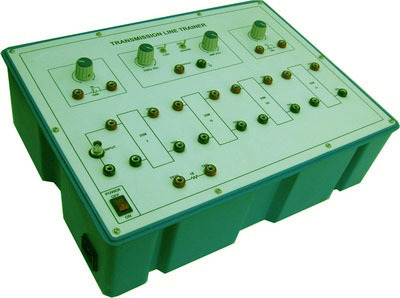 Experimental training board has been designed specifically to study the various parameters in transmission line. Practical experience on this board carries great educative value for science and engineering students. 4 Nos. Coaxial Cables 25 meters each, total Transmission line 100 metres. Two potentiometers for impedance matching. Sine/Square wave Signal Generator having frequency 40KHz to 4MHz, in two bands 40KHz to 400KHz & 400KHz to 4MHz. A SPDT switch to select either sine or square wave. A SPDT switch to select frequency either high (400KHz to 4MHz) or low (40KHz to 400KHz). A potentiometer to vary frequency high (400KHz to 4MHz) or low (40KHz to 400KHz). A potentiometer to vary amplitude. BNC connector to connect input. Adequate no. of other electronic components. Mains ON/OFF switch, fuse and jewel light. Adequate no. of patch cords stackable from rear both ends 4mm spring loaded plug length ½ metre. Good Quality, reliable terminal/sockets are provided at appropriate places on panel for connections /observation of waveforms. Strongly supported by detailed Operating Instructions, giving details of Object, Theory, Design procedures, Report Suggestions andBook References. Established in 1954, we Advanced Technocracy Inc, an ISO 14001:2004 Certified Company. We Advanced Technocracy Inc. take pleasure in introducing ourselves as one of the leading Manufacturers, Suppliers, Importer and Exporter of Educational Products, Medical Products, Healthcare Products, Hospitals, Agricultural, Food Processing, Engineering & Electrical, Industrial Products and Supplies, Construction Materials and Equipment, Chemical, Automobile, Solar, IT & Telecom and Infrastructure Projects. The company specializes in customized product development, bulk quantity supplies strictly as per scheduled deadlines, such as in MOE, MOH, IDA funded projects. In fact, the company has many global projects and tenders of World Bank, ADB, UN, UNDP, UNICEF, UNESCO, WHO etc., to its credit, which were spread over different countries in the world. Advanced Technocracy Inc. is a business organization, specializing in many products and markets. The export performance of the Company and its efforts to serve the nation has been recognized by the Government Of India. We are supplying quality equipment like Petroleum Testing Equipment, Oil Testing Equipment and various Physics Lab Equipment.